With the explosion of the digital world, one might expect a drastic decrease in the use of print design material for the purposes of marketing, advertising and communication. On the contrary, the volume of print design and layout continues to increase at an alarming rate. Computer art has made custom print design and layout for small business faster to create and cheaper to produce, while advancements in printing have made the �short run' print jobs an everyday occurrence. Any size and any target, we will help you decide what type of print design brochure will work best for your print marketing campaign. Whether it be postcards, self mail print design brochures or printed flyers, we'll not only work with you to decide what direction is best, we'll take care of you every step along the way. You know your business, and we know print advertising, together we will produce an outstanding print marketing piece. Have a lot of products or services to offer? Let us help you show them off with a custom print layout catalog! A great product can be hurt by poor print packaging, we help you enhance your products with a great look! Custom print design and layout for small business will help you to communicate with your target market and stand out from the crowd. 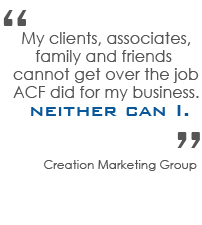 Here at ACF Consulting, we will bring our knowledge and expertise of print design and layout to your team. We will work with you from initial conception through development and even have the finished, custom print design and layout product delivered to your door.